The Ebac Powerdri dehumidifier is built by the UK's leading dehumidifier manufacturer. Ebac has established a reputation for the quality and reliability of its dehumidifiers and this machine is no exception. The Powerdri is rated for a home of up to four bedrooms, 180 M2, and will certainly be effective for domestic use. 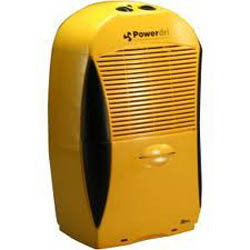 Its bright yellow case may not suit some users who site their dehumidifier in a living room or hallway and for those who find the colour too bright the Ebac 2650e Dehumidifier, in white and with a similar capacity, may be preferable. For those, however, who want a powerful and robust machine for an area such as a garage or cellar/basement the colour may be less important than the ability of the Ebac Powerdri dehumidifier to operate at temperatures as low as 2°C. Ebac have taken pains to achieve high levels of energy efficiency with their dehumidifiers and the Ebac Powerdri dehumidifier incorporates several energy saving features. "Intelligent defrost" is an Ebac innovation found in this machine. All dehumidifiers which use refrigeration coils to condense water from the air will suffer from a problem at lower temperatures, below around 15°C. Ice will form on the coils and cause the machine to stop, to prevent damage, and unless a defrost feature is included in the design this makes the dehumidifier unsuitable for colder areas, such as a garage. Many dehumidifiers incorporate "hot gas defrost" which solves the problem but at a cost in energy. "Intelligent defrost" anticipates when freezing is about to occur and suspends refrigeration of the coils for a period, allowing the coils to defrost more quickly and at a lower energy cost. "Hydrophilic" coils provide another saving. The coils are coated with a "hydrophilic" substance which causes water to drip more quickly from the coils and thus speeds up both the extraction and collection of water, thereby saving energy. The Ebac Powerdri dehumidifier is also equipped with an adjustable humidistat which switches the machine off when the pre-set humidity level is reached and only switches it back on if and when the humidity rises above that level. This prevents the machine running wastefully and also avoids the risk of humidity falling too far. which can be uncomfortable for people and damaging to some materials such as leather and wood. The Ebac Powerdri dehumidifier is capable of a maximum water extraction rate of 18 litres per day. Please do not expect that rate to be achieved in the conditions normally found in your home. In the table below you will see that the figure of 18 litres was recorded at a temperature of 32C and a relative humidity of 90%. Extraction rates fall dramatically in cooler, less humid conditions. All dehumidifier suppliers quote the figure this way. All it tells you is that one dehumidifier will extract more water in a given time than another. Quoting the rate under "standard" conditions, however unrealistic, makes it possible to compare two different dehumidifiers on a level playing field. Additional features of this dehumidifier include fitted castors to make it easier to move from place to place and a continuous drainage kit supplied as standard. Since the water collection container holds 3.5 litres it would need to be emptied at least once, and often more than once, during every 24 hours. Continuous drainage allows you to run a small plastic pipe from the dehumidifier to a drain, a sink or sump so that water from the appliance drains away as it collects. As well as being more convenient this is of particular benefit if the dehumidifier is being used in a place which you do not usually visit every day. Castors and a continuous drainage kit are optional extras, for which a charge is made, on most other Ebac dehumidifiers but are offered as standard with this model. The Ebac Powerdri dehumidifier comes with a five year, free warranty but only if it is bought direct from Ebac. You will find the appliance offered at lower prices by third party suppliers but typical free warranties offered are one or two years and extra years will only be offered at additional cost. You should also be aware that warranty claims made against third party sellers cannot be taken up with Ebac, only with the supplier. The same applies to returns, refunds and replacements. When buying from third party suppliers it is only sensible to compare prices inclusive of that supplier's additional charges for a five year warranty and judge value for money accordingly. The Ebac Powerdri dehumidifier is a robust machine that is relatively energy efficient. The low minimum operating temperature and continuous drain facility make it entirely suitable for use in relatively more remote, cooler parts of your home. The adjustable humidistat makes it equally suitable for use in living areas and it will be entirely effective in this environment. The "image conscious" handy man or woman may prefer the yellow colour if the machine is being used to keep a workshop dry, for example, or to dry out the plaster in a newly built extension, as the appliance does not look like a typical domestic dehumidifier. The price is a little higher than you might pay for some dehumidifiers with a similar performance. It is a matter of judgement as to whether the better build quality and consequent reliability justify the price. The colour may be considered by some to be inappropriate for living areas of the house. The only negative comment noted so far has been that the water extraction rate is far below the quoted level. This is quite normal as extraction rates vary with changes in the ambient temperature and relative humidity.